One of Nebraska’s more creative, accomplished, and energetic women, Elizabeth Callaway was a painter, illustrator, printmaker, photographer, poet, published writer, mountain climber, and avid traveler. Her son, John Turnbull, described her as “never one to pass up a chance to see and do more.” As an example, he told of the trip she took in 2000 to Montana to climb the summit of St. Mary’s Peak in the Bitterroot Mountains with friends. At that time, she was 83 years old, and was also enrolled in poetry and photography classes at the University of Nebraska in Lincoln. She graduated from Fairbury High School in 1935; attended Hastings College in Hastings, Nebraska for two years; and in 1940, graduated from the University of Nebraska in Lincoln with a B.A. degree from the College of Arts and Sciences. Her art studies included design, drawing, painting, and color harmony. Among her teachers were Dwight Kirsch and Kady Faulkner, both highly respected fine art painters and educators who promoted modernist and regionalist styles. However, the positive experiences in Colorado were countered by events in Europe, and the Turnbulls, like so many other Americans, had their lives totally re-directed. When Murray was drafted in 1943, Elizabeth took a job in Chicago as a writer for Encyclopedia Britannica, Inc. After she gave birth to son John in 1944, she returned to family in Fairbury until the war was over. She and her baby joined her husband in Great Falls, Montana, when he returned from the South Pacific where he had been an Army Air Corps weather observer, but within a few years the marriage ended. After the war, Murray briefly returned to the Art Department at the University of Nebraska in 1947, teaching a class in perspective, before settling in Hawaii. He lived there to age 95, becoming a prolific fine art painter, stained glass artist, sculptor, and distinguished as Professor of Art and Dean of the College of Liberal Arts at the University of Hawaii. Elizabeth again returned home to her parents, this time with two children. However, by November 1957, her life was re-directed. She, John, and Sue were in China Lake, California living on the Naval Ordnance Test Station (NOTS), a military base where Elizabeth was working as an Aviation Ordinance technical illustrator. The children were enrolled in naval base schools. This transition happened because of Con Callaway, Elizabeth’s brother and career Naval officer, who was aware both of her talents and of the need for technical illustrators to work with weapons engineers at the NOTS operation. Con was the Executive Officer of the Test Station Airfield. She kept the job for the next 25 years and, much lauded for the quality of her work, did numerous drawings. The most well-known were the Sidewinder air-to-air missile, Walleye TV guided bomb, and the HARM air-to-ground missile. Ironically the new position did not give Elizabeth much chance to be with her brother because, two weeks after she arrived, he retired from the U.S. Navy after 30 years of service. He moved to Florida where he took a job with Lockheed Corporation (now Lockheed Martin) as Assistant Manager of the Polaris Missile Test Base at Cape Canaveral. For Elizabeth the years in California brought great satisfaction. She had settled with her children in a vital, goal-driven community of skilled, intelligent persons. She thrived both as a professional and as a person with leisure-time activities including photography and mountain climbing. About photography, she described it as “opening up a whole new world for me.” (Boultinghouse) Her son John recalled her as a determined picture-taker, who during his childhood used “a range finder camera for a number of years….I remember her taking notes about the camera settings for each shot when I was still in grade school.” In the 1960s, after returning from his duty in Vietnam as a helicopter pilot, he gave her a single lens reflex Pentax Spotmatic, the model of camera he had used in the military. With this, she elevated her photography to fine art by adjusting lenses for unique perspectives such as close ups of “ripples on a pond”. (Rocketeer) Also using this camera, she did a 70-mile photographic excursion with nine members of her mountain rescue climbing group. Combining their photos, they created a slide show for a fundraising project. In May 1982, Elizabeth retired from the Naval Ordinance Station, but she stayed in the area for another five years to be near friends and the many mountains she loved to photograph and climb. Her home during that time was in the nearby town of Lone Pine in the shadow of Mount Whitney. In 1987, she said a final goodbye. Looking back on those years, she wrote this poem. 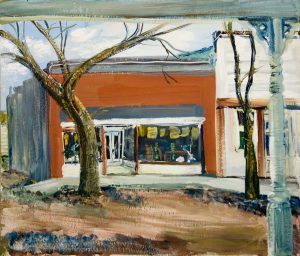 Elizabeth next moved to Lincoln, Nebraska, where she purchased a townhouse and centered her life on painting, literature, photography, and writing. She also took time in 1991 to honor her Callaway family heritage by officially changing her name to Elizabeth Callaway, dropping last names in her signature of husbands, Turnbull and Anderson. In Lincoln, she entered paintings in exhibitions of the Lincoln Artists’ Guild. Her oil painting, Village Street, is now in the collection of the Museum of Nebraska Art, courtesy of the Artists’ Guild. She enrolled in the University of Nebraska, earned a Master’s degree in English Literature in 1994, and took additional University classes including photography and poetry. Before her return to Nebraska, Elizabeth had traveled extensively including to England in 1975 and 1978, and in the mid 1980s to Japan and Vladivostok, Russia where she boarded the Siberian Railway to Moscow. In the 1980s she drove with her beloved German Shepherd dog, Festus, throughout the American Southwest. There she did exploring and collecting, especially related to the Indian culture. In 2003, indulging her love of the Southwest, she packed up her books and rocks and moved from Lincoln to Cortez, Colorado where she could be close to mountains, people, and a culture that appealed to her. However, age was making demands, and four years later, in 2007, Elizabeth, having told her family that her “warranty had run out,” again moved back to Nebraska. She chose to live in Seward, because it was between her son and family in York and her many friends in Lincoln. She died at age 91 on May 1, 2009 in Seward. The Museum of Nebraska Art has one work by Elizabeth Callaway. Rocketeer (China Lake, California), newspaper: 1975 or 1976, “Employee in the Spotlight” Courtesy of John Turnbull. Turnbull, John, Personal Interview, York, Nebraska, October 12, 2016, and follow up emails to Lonnie Dunbier. John Turnbull is the son of Elizabeth Callaway and Murray Turnbull. Valley Living (Ridgecrest, California), newspaper: 5/7/1982, Boultinghouse, Vivian, “Elizabeth Anderson deep in photography” Courtesy of John Turnbull.